Manchester - Liverpool's Sadio Mane was dismissed for a challenge that saw goalkeeper Ederson stretchered off as Manchester City destroyed their Premier League title rivals 5-0 on Saturday. Brazilian Ederson was carried off in a neck brace after being caught in the face by Mane's foot as he raced out to head the ball away late in the first half and the Liverpool forward was shown a straight red card. City already led 1-0 through Sergio Aguero's opener at that point and braces from Gabriel Jesus and substitute Leroy Sane completed City's biggest win over Liverpool since March 1937. With Liverpool having avoided defeat against their top-six rivals last season, it was the first time Jurgen Klopp's side had lost to one of their principal adversaries since a 1-0 loss at home to Manchester United in January 2016. It meant Alex-Oxlade-Chamberlain had a deja vu debut after coming on at half-time for Liverpool, having succumbed to a 4-0 defeat against his new club on his last appearance for Arsenal before the international break. While Mane's dismissal was a key factor in the game's outcome, the emphatic nature of City's win suggests Pep Guardiola's second season as manager will yield a serious title challenge. City are unbeaten in 12 league games, their best run under Guardiola, while Argentina striker Aguero is now the outright leading non-European goal-scorer in English top-flight history with 124 goals. It took City 24 minutes to unpick the visitors' back four as Kevin De Bruyne's delicately weighted through-ball freed Aguero to skip past Simon Mignolet and score for the sixth successive home game against Liverpool. Guardiola had reverted to a 3-5-2 system and left-sided centre-back Nicolas Otamendi immediately looked vulnerable against Liverpool's speedy right-winger Mohamed Salah. Otamendi was booked for clattering Salah in the sixth minute and after City's opener, the Argentinian's poor positioning allowed Mane to release Salah, only for Ederson to come to the rescue with a smart save. City continued to carry the greater threat and tested Mignolet twice in quick succession, the Belgian blocking a shot from Jesus, who had robbed Ragnar Klavan, and jutting out a foot to thwart John Stones from the ensuing corner. Two minutes later the game's pivotal moment occurred. Joel Matip's lofted pass sent Mane scampering clear and as Ederson rushed from his line to head the ball clear, the Senegal forward leapt and caught him in the face with his outstretched right boot. It was unintentional but reckless and referee Jon Moss immediately flashed a red card. Flattened by the collision with Mane, Ederson spent eight minutes receiving treatment on the pitch before Claudio Bravo came on in his place. Ederson was reported to have undergone tests for a suspected fractured jaw and cheekbone. The added time enabled City to swell their lead, De Bruyne crossing from the left for Jesus to head home moments after a goal issuing from the same combination had been ruled out for offside. 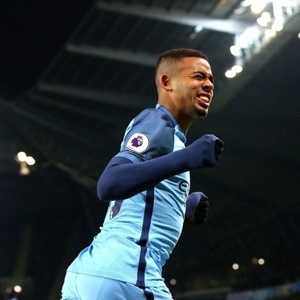 Any Liverpool hopes of a second-half fightback evaporated within eight minutes of the restart as Fernandinho freed Aguero, who unselfishly teed up Jesus to tuck away his second goal. Sane added a fourth with 13 minutes to go, brilliantly sweeping home debutant Benjamin Mendy's left-wing cross, before putting the cherry on the cake in stoppage time with a sublime curler into the top-left corner.